The Standards for Social Work Practice with Groups were developed by an expert panel of group work educators, practitioners, and researchers. 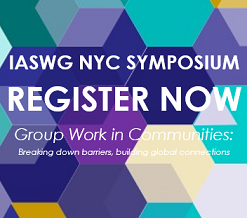 The IASWG recognizes that social work practice with groups reflects a broad domain of professional practice. These Standards reflect the distinguishing features of group work and illuminate the unique perspective that social group workers bring to practice. Standards for Social Work Practice with Groups is available in English, French, and Spanish. Please take a minute to download or read the Report of the Survey on AASWG Standards for Social Work Practice with Groups. There have been many publications on the Standards, including a special issue of Social Work with Groups dedicated to the Standards. Click here for the references to the empirical research and articles on the Standards. These standards reflect the distinguishing features of group work as well as the unique perspective that social workers bring to their practice with groups. Central to social work practice with groups is the concept of mutual aid. The group worker recognizes that the group, with its multiple helping relationships, is the primary source of change. The group worker’s role is one primarily of helping members work together to achieve the goals that they have established for themselves. By design, these standards are general, rather than specific. They are applicable to the types of groups that social workers encounter in the full range of settings in which they practice. Further, the standards allow the individual practitioner to apply a variety of relevant group work models, within the more general mutual aid framework. Section I. identifies essential knowledge and values that underlie social work practice with groups. In Sections III. through VI., worker tasks in the pre-group, beginning, middle, and ending phases of the group are identified, as is specific knowledge that may be needed by the worker in each phase. Member interactions as manifestations of sociocultural forces of race, class, gender, sexual orientation, etc.